Eastern Shore Post, the only locally owned newspaper on the Eastern Shore of Virginia, is published each Friday. Pick one up for free at any of the hundreds of distribution sites up and down the Shore, from Pocomoke, Md., to Cape Charles, Va. These include convenience stores, grocery stores, offices, large retailers, all of our advertisers and our office at Four Corner Plaza in Onley. 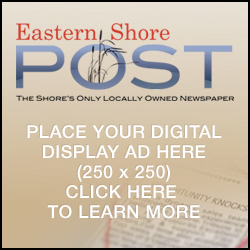 Eastern Shore Post has been published each week since 1999, after Cheryl Nowak and Candy Farlow decided that Virginia’s Eastern Shore needed a locally owned newspaper and got together to provide one. Since then, we have expanded to offer complete news of Accomack and Northampton counties, as well as commentary, event announcements and, most recently, local sports. If you would like your business to be a part of ours, simply contact us for advertising opportunities.